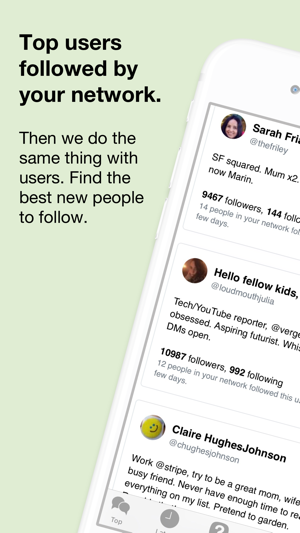 Do you love Twitter but wish you could find the best tweets and new users to follow, without having to use it all day? 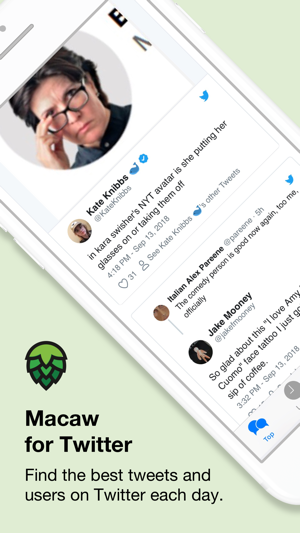 Macaw is a feed of the top tweets that the people you follow have liked and the users that they have recently followed. View the tweets and users they find interesting, and let them do the hard work of going through Twitter and finding what's good. 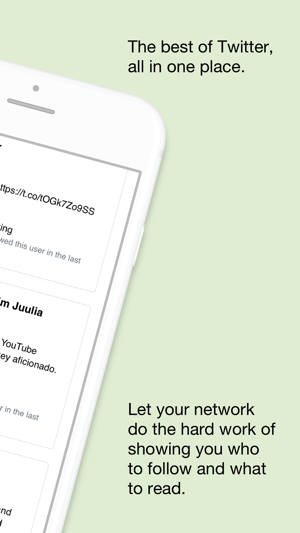 Expand your network and see the best of Twitter — download and sign up today! Only on iOS. If you like Macaw, donate! Payment will be charged to iTunes Account at confirmation of purchase. Subscription automatically renews unless auto-renew is turned off at least 24-hours before the end of the current period. Account will be charged for renewal within 24-hours prior to the end of the current period, for the same price as you choose above. You may manage your subscription or turn off auto-renewal by going to your Account Settings after purchase. Visit macawfortwitter.com/terms or macawfortwitter.com/privacy for more information. And let's all pray that @jack doesn't get rid of likes. - Daily notifications! Go to the Settings tab and turn them on so you get a reminder at the end of the day to check Macaw and catch up on what you missed from Twitter. - More topics! Now instead of just "asks", you get a bunch of other topics to choose from. Look at likes from your network that mention books, companies that are hiring, and more. - Pull to refresh! Simply swipe down on a tab to refresh the content in that tab. - Share with a friend! Recommend Macaw easily directly from the Settings tab. - iPad friendly! Now you can use Macaw on your iPad. Plus, it doesn't look insane on iPhone SEs. - And some other stuff — it's faster, plus there are new designs for the Settings tab, tutorial, and launch screen. This app is a must for all those like me who have a twitter addiction. 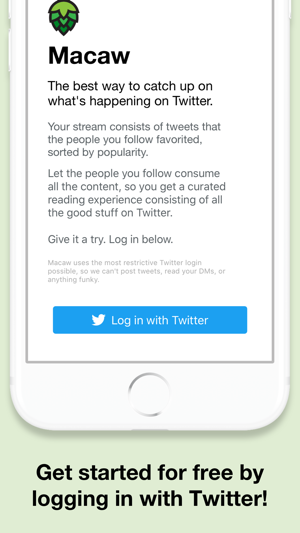 Macaw has really great features like finding people to follow that share similar interests, but all in all it truly makes your twitter experiences more enjoyable. 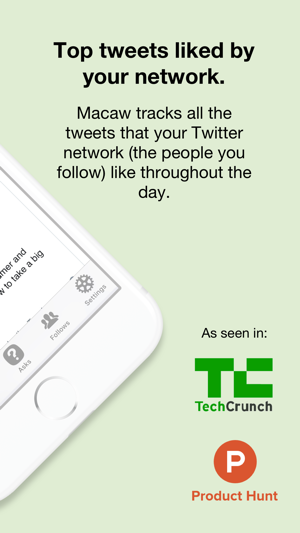 This well-organized app provides valuable insights into the activity of one’s Twitter followers. Utilizing web views seems to ensure Official API support into the future. Did I mention it’s without dollar cost?! 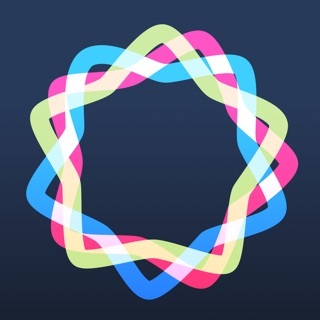 This Macaw app is very easy to use. Working smoothly and really convenient for me to use to get updates for my Twitter account.